Home » Meet the Scientists » David P. Friedman, Ph.D. I am a neurobiologist. I want to understand how the brain works, and most especially, how drugs of abuse, like cocaine and alcohol change the way it works. I was always interested in science. I had a chemistry kit as a kid, and a telescope, and was the first kid I knew to dissect a frog. There was a fly in its stomach, which I thought was really cool. In college I majored in biology, but minored in chemistry, psychology, and philosophy. The last two were what really got me interested in the brain. I wanted to be a psychologist but thought that learning more about how the brain actually worked would be the best place to start. After I got my PhD, studying sleep and arousal, I had postdoctoral positions at Washington University and the National Institute of Mental Health. Eventually I was able to “trace” a pathway through which information from our skin was processed so we can feel it, and then eventually fed to the parts of the brain where it is stored as a memory. 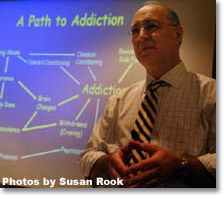 Then, the National Institute on Drug Abuse decided to start a neuroscience research branch. The word neuroscience hadn’t even been invented when I started grad school, so this was a pretty exciting opportunity. But instead of doing science, my job was to give money to other scientists, which permitted me to help guide the field while it grew. But I wanted to go back to the lab and moved to Wake Forest University School of Medicine. There, while studying cocaine’s effects on the brain, I met a colleague who had taught monkeys to drink alcohol. She asked me to work with her to study the brains of these monkeys, some of which got very drunk indeed. We knew that alcohol’s ability to change people’s behavior (that is, to produce addiction) was due to its effects on the brain, and we began to explore just what those changes are. We’re far from an answer yet, but the pursuit of this question is my passion. Well, it’s my passion if you don’t count sports. If it had a ball and/or a stick, I played it, which wasn’t always the best thing for my grades. My softball team, made up almost entirely of scientists, was the league champs at the National Institutes of Health for years. Now, it’s mostly racquetball and golf. When we go out to play golf, we tell our colleagues that we’re going to a “physics seminar!” I also throw pots. All that intellectual work with the left side of my brain during the day is tiring, so making pottery, a decidedly right brain activity, is a nice break. The image shows a brain region affected by cocaine. The right side is normal, and the left from an animal that took cocaine for almost a year. The normal side has lots of yellows and red, showing the normal level of a protein called a dopamine receptor. 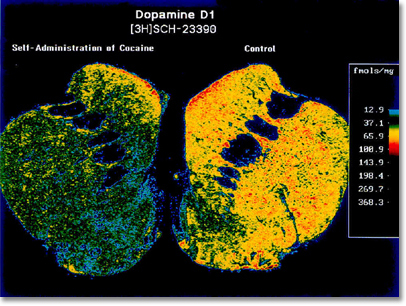 The loss of yellow and red on the left, shows that cocaine reduces the levels of this receptor; this may explain the drug-seeking behavior that results.